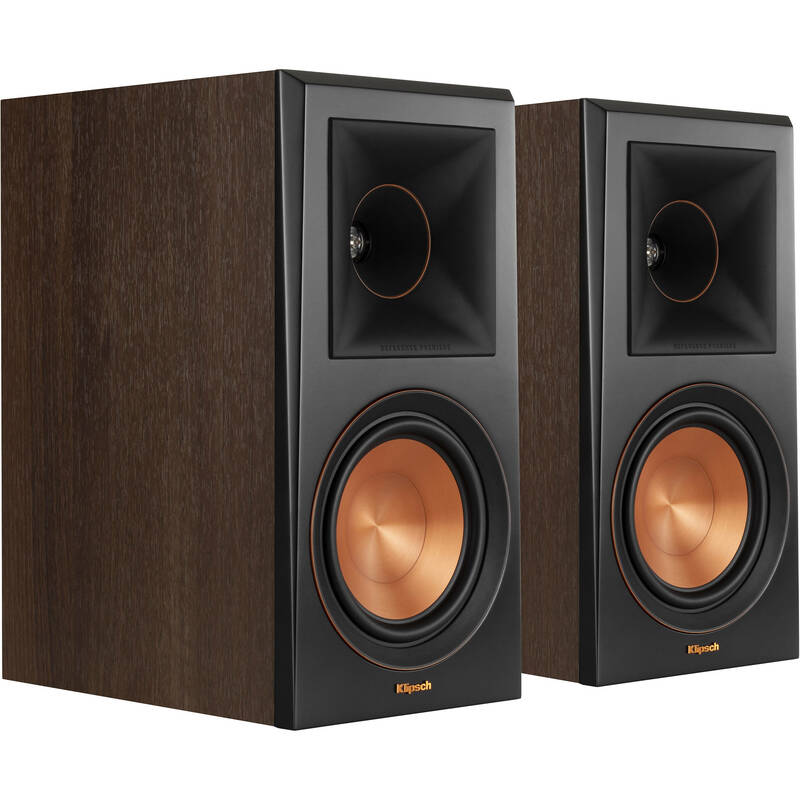 Bring pure, natural sound to your home theater with this pair of walnut Reference Premiere RP-600M 2-Way Bookshelf Speakers from Klipsch. Featuring a two-way speaker design, each RP-600M incorporates a 1" titanium LTS vented tweeter paired with a hybrid Tractrix horn and a spun copper 6.5" Cerametallic woofer. The RP-600M delivers a frequency response of 45 Hz to 25 kHz and can handle up to 100W of continuous power from your amplifier of choice. The RP-600M incorporates a Tractrix horn designed to enhance efficiency and increase detail while focusing high frequencies towards the listening area. The horn uses a phase plug and a compressed molded silicone face to ensure smooth frequency response and deliver clean, natural sound. The speaker's design includes a Linear Travel Suspension tweeter that minimizes distortion for enhanced, detailed performance. The vented tweeter housing reduces standing waves that create unwanted harmonics. This tweeter design results in enhanced detail and clarity in high-frequency reproduction. The RP-600M's Cerametallic woofer combines high rigidity with a lightweight construction to minimize distortion. It pairs seamlessly with the Tractrix horn-loaded LTS tweeter to deliver enhanced speaker efficiency. Using Tractrix geometry, the RP-600M's port allows for efficient, fast air transfer from the cabinet, reducing port noise and resulting in punchier low frequencies. Inner flares help reduce air turbulence entering the port for cleaner, more powerful bass. The RP-600M is equipped with dual input terminals for bi-wiring / bi-amping capabilities. Bi-wiring separates high- and low-frequency current into separate speaker cables, reducing intermodulation distortion for a clearer midrange. Bi-amping allows for customization using outboard crossovers when using separate amplifiers. The RP-600M's 5-way screw terminals accept banana plugs or bare wire up to 12-gauge for a flexible, lasting connection. To facilitate setup, the terminals are color coded. The speaker cabinet boasts a walnut vinyl finish, as well as satin-painted baffles with a scratch-resistant finish. The speaker's strong and flexible magnetic grille can be easily mounted/removed. The RP-600M's design includes copper anodized trim rings, cast aluminum feet, satin painted baffles, and a laser-etched logo. Box Dimensions (LxWxH) 22.3 x 20.3 x 16.7"